Happy new year! I hope you are having a wonderful start to 2016. I am just getting back into the swing of things after being out of the country for a few weeks. We traveled to the Netherlands and Israel to visit family over the holidays, which was so wonderful and much needed. I absolutely love traveling and exploring new places, cultures, and, of course, food. Eating is such an important daily ritual that brings people together and it's so fun to observe how other cultures enjoy their meals. Tastes of other cultures always inspires me and I love to bring back special items, like spices or sweets, and incorporate them into new dishes back at home. 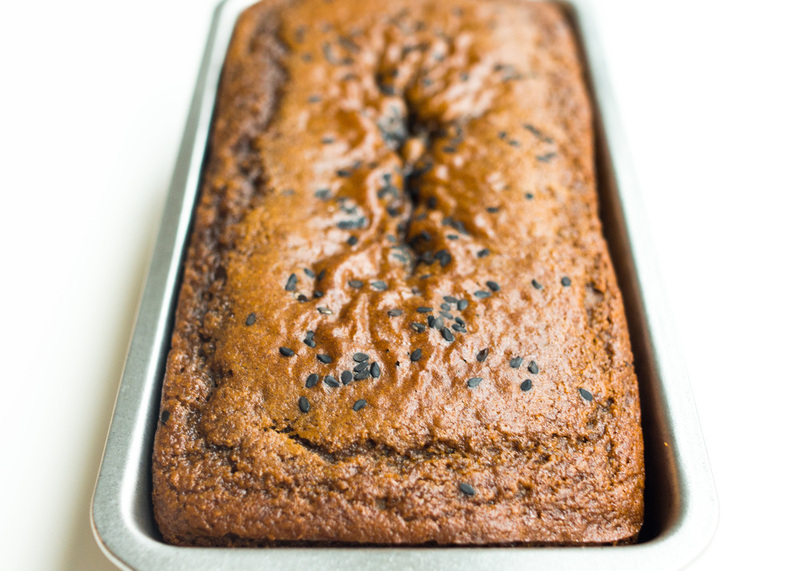 The flavors of this Cardamom Tahini Date Loaf were clearly inspired by my trip to Israel. Tahini, which is a paste of ground up sesame seeds, is an absolute staple in an Israeli kitchen. It is eaten as a spread (stirred with water, lemon juice, garlic, and salt), mixed with chickpeas to make hummus, or baked into cookies, among a million other ways. Essentially, tahini is to Israelis what both peanut butter and ketchup are to Americans. In this loaf, the tahini imparts a subtle nutty flavor that complements the powerful aroma of cardamom. The loaf is very barely sweet to keep it on the lighter side and sweetened only with date syrup, which is a sweetener made only with medjool dates (I know there are new year resolutions to be kept!). If you're looking for more of a dessert-y taste, I suggest adding a bit more date syrup or even coconut sugar. I brought back date syrup with me from Israel, but I think you can find it in specialty grocery stores or probably on Amazon. If not, it's pretty simple to make: soak pitted medjool dates in water until soft and then blend with the soaking liquid. The amount of water you add will determine the viscosity of the date syrup. The viscosity of the date syrup I used was somewhere in between that of maple syrup and molasses. The loaf itself is extremely simple to make with a beautiful and delicious result. It is perfect in the afternoon with a cup of coffee or even baked into muffins for an easy breakfast. Or, if you're like me, great for taking small slivers throughout the day to transport you into vacation day dreams. Enjoy! בתאבון! In the bowl of a stand mixer or with a handheld mixer, beat the tahini, date syrup, apple cider vinegar, and almond milk on medium speed until mixed. Add eggs, one at a time, and vanilla extract, and mix on medium speed until combined. In a small bowl, whisk together the remaining ingredients. Add the dry ingredients to the wet and mix on medium speed until fully mixed. Grease and line a 8 x 4 loaf pan. Pour batter into pan and sprinkle black sesame seeds on top, if using. Bake for 45-50 minutes until the top of the loaf springs back when lightly touched. Let cool completely before serving. Enjoy! NOTE: The tahini is extremely important and differs significantly by brand in America. My favorite (and the only one I would recommend) is the Whole Foods brand tahini. It comes in a white bottle with a green cap and it actually is a product Israel (check the back label). If not using this one, the taste and texture of the loaf may vary greatly.